Data backups should play an important part in a computer user's schedule. Backups ensure that data is not lost if it gets deleted, overwritten or edited. This can be accidental or because of hardware failures or virus attacks. Backups can even ensure that data is still there if a computer gets stolen if the backup destination was an external destination. Paragon Drive Backup 2010 is a backup solution for computers running a Microsoft Windows operating system. It is basically a lighter version of the more expensive Backup & Recovery Suite that is offered for $69.95 at the Paragon website. It is an easy to use backup software that provides everything necessary to perform data backups and restoration. Paragon Drive Backup makes use of the usual Paragon software interface that puts the tasks that can be done with the software in the left sidebar, and information about the active task in the main window. The tasks are divided into Basic Backup / Restore Tasks, Advanced Backup Tasks, Tools and News and Documentation. 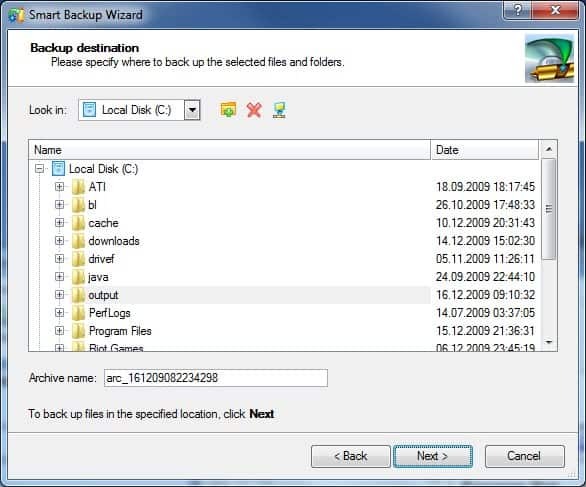 The basic backup and restore tasks can be used to perform a smart backup, schedule disk, partition or file backups, and torestore a previously created backup. Any selection will open a wizard guiding the user through the steps to perform the selected task. 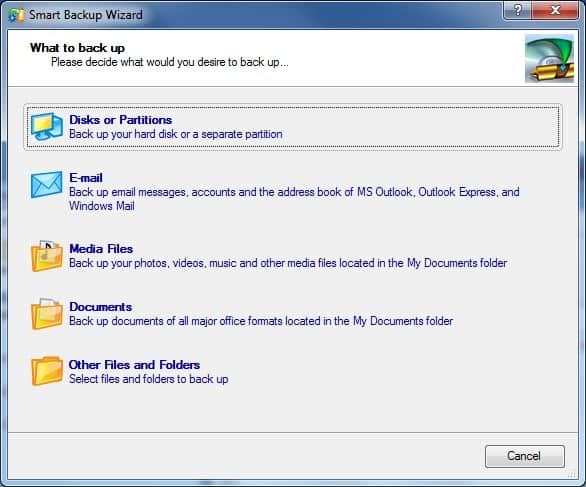 Smart Backup: Gives the user options to backup partitions, entire hard drives, files, email (Windows Mail and Outlook), documents in the MyDocuments folder or media files that are located in the same folder structure. Backups can be executed right away or scheduled. 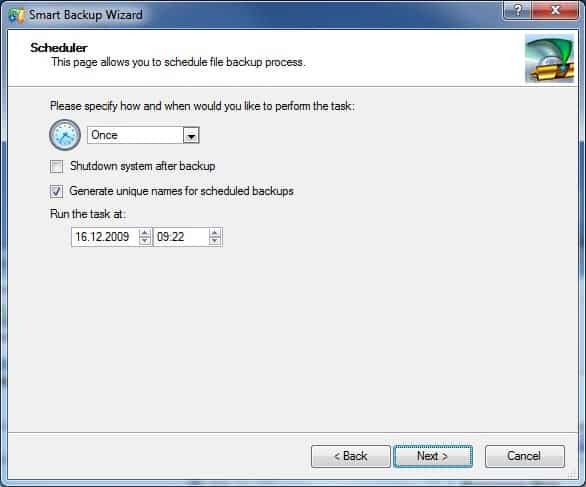 Schedule Backup of Disk or Partition: A faster way to schedule backups of disks and partitions of the computer system. Schedule File Backups: A faster way to schedule file backups. Restore: Ability to restore backups that have been created in the past. File backups can be further customized by using so called include and exclude masks that make sure that certain file types or names are included or excluded from the backup. That's very handy for operations where specific file types need to be backed up, for instance all document formats on drive C.
The advanced backup tasks offer differential partition backups and incremental file backups which can be used to reduce the size requirements of backups. Paragon Drive Backup will automatically use compression technologies to decrease the size of the backup. The tools section finally can be used to create recovery media so that the data can be recovered even if the operating system fails to load. Most users might want to start with this option to have the means to restore the backups if the OS should fail to load. One interesting option provided by Paragon Drive Backup 2010 is the archive integrity checker which can verify the integrity of previously created backups. This checks previously created backups for data corruption. 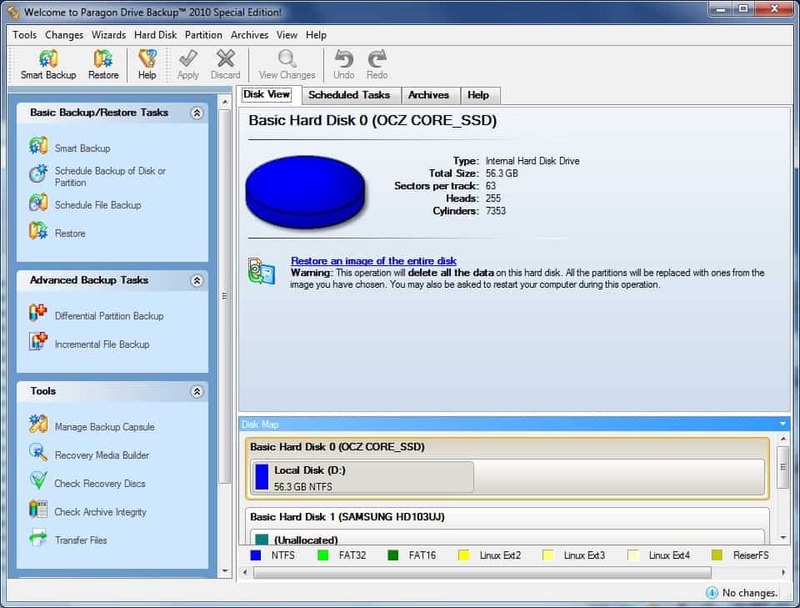 Drive Backup can create a backup capsule on a connected hard drive that will then be used to store the backups that are performed by the software. Paragon Hot Processing, Microsoft VSS Support - Ensures that all files and folders are copied even if Windows is running. Paragon Drive Backup 2010 Special Edition is an easy to use backup solution for the Windows operating system. It is relatively easy to use and configure thanks to the wizards that are displayed whenever a task is created. 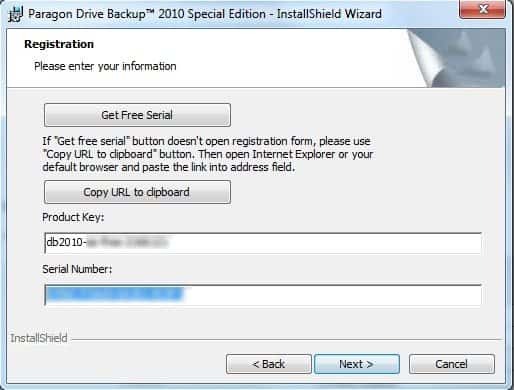 The review of Paragon Drive Backup 2010 looks at the program's capabilities and features, and provides tips and instructions on how to use it. And what about us whos ISP block p2p and torrent?Nothing, right?! Vandalism, I’m sorry to hear that but maybe it is time to tell your ISP that there are legit torrents out there. The reason why we have selected Bittorrent is because it was the only available solution. Yes, definitely sounds like software worth installing – count me in. Nice software. I am using currently version 9.0 of Paragon Drive Backup and definitely will change to Drive Backup 2010. Thanks guys for this giveaware. I Tried some free backup software, but not work quite the way I want. I think Paragon will just work for me! The trackers for the x86 version are all down. Add tracker http://tracker.publicbt.com/announce to get some seeders. Matt trackers working on my end. Where do I have to add the new tracker? Wow,this is a great prize.Sure hope I’m a winner. Yet another backup app to checkout. Thanks for sharing. Thank you very much, Ghacks and Paragon ! That was a nice Christmas present. Both of the Torrent’s worked fine to download, as I’m useing x86 32bit, that one is now installed on my computer and working just great. It’s a nice software! Had only one problem, maybe other of users here noticed the same as I did. Furthermore we recommend to not typing the data manually into the registration window, but to copy them by clicking “Ctrl” + “C” and then paste them using “Ctrl” + “V” to prevent misprints. As you can see, this text above was copied from e-mail and paste into this textfield – But it was not possible to paste the serial nr and the key into the installer…It’s the second time this happened myself when installing software. If I try paste the same text or numbers into an texteditor program it works great without any issues, very weird. This may occur because of some other applications installed on your PC. You still can type in the key and serial number manually, nothing wrong with that. Copy/paste method simply gives less typos. thanks for the gift. Do you know the md5 Checksums for the files? Thanks ghacks for this great tool. Thank you so much for putting up this giveaway. I lost my setup/installation file for DB pro 9. Was looking for a working download of the old one. Glad I found this now. Would love to find a good PC backup solution.